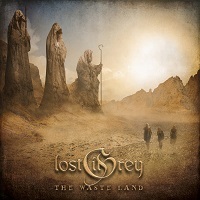 This year starts off with Finish Theatrical Metal band LOST IN GREY releasing their second album “The Waste Land”, following on from their 2017 debut “The Grey Realms”. This album, which runs for just under an hour, explores the nebulous idea of “The Waste Land”, which is an alternate place filled with bottled-up thoughts and emotions. Here these resonate through the desolate landscape, timelessly waiting to be dealt with. This album, which draws heavily on Symphonic and Folk influences, also features a slew of guest musicians to help make this concept possible. Starting off with the eponymous “The Waste Land”, we get launched straight into not only the music, but also into the idea behind the album, with lyrics like “This is where I hide my feelings” giving us a glimpse into the concept. A skipping melody give the impression of time passing, whilst tempestuous thoughts weave a sonic maelstrom, all demanding attention. “Expectations” on the other hand has a much stronger Folk influence, starting off with an upbeat tempo before slowing down and sinking into a leisurelier and more ponderous melody before once again swelling into a chorus-laden swirling song. “Unohdukseen Katoaa” sees the album take a heavier twist, and the language turn to Finnish, with gravely growled male vocals providing an impressive counter to the sweet operatic female vocals which come in later. Somehow, I find this language suits the music better than English; it somehow seems more expressive. Which is more the pity that this is the only non-English song on the album. In contrast, “1992” sees the pace get taken down a notch, with an ephemeral melody leading to a melancholic clean vocal section that gradually blossoms into a slow and lumbering song. At points, this seems to drag on a bit, making the mid-paced “Far Beyond and Further” a welcome change. However, with “Wolves Among Men” our straying attention is recaptured. This is one of the most original songs on the album, with a somewhat sinister atmosphere and darker vocal style making it stand out from the rest of “The Waste Land”. Thanks to this, this song was by far my favourite on the album. In the penultimate spot we have “Prelude for Emptiness” which returns once more to the folkier feeling, with tribal chanting giving this interlude a ritualistic air. Saving the longest for last, “Drifting in the Universe” closes off the album, starting off with a soft, otherworldly melody that gradually unfolds into a delicately woven song that takes its time to explore each of the melodic aspects it brings up. This song has it all, from galloping guitars to beatific choirs and dramatic vocals, to odd disharmonic sections and the mandatory searing guitar solos later in the song. However, here again, I sometimes have the feeling that the song meanders a bit too much. Whilst one could describe “The Waste Land” as multifaceted, some of the different styles have a thrown together, haphazard feel at times, which in my opinion detracts from the flow of the music. I also have a similar gripe about the mixing. Whilst intricate layers are a must in Symphonic Metal, this occasionally goes over-board, resulting in individual elements getting lost underneath everything else. This is a huge pity, as there was clearly a lot of time and creativity put into this project. Overall, “The Waste Land” is a solid Symphonic release that takes you on a journey through sonic soundscapes that tell a story. However, it is in a few rare parts like “Wolves Among Men” do we see what the band is really capable of, and if they manage to hone in on this sound, and make it their very own, then LOST IN GREY could very well be a force to be reckoned with. Put succinctly, despite several negative points, LOST IN GREY show a lot of potential, and undoubtedly find themselves on an upward trajectory with “The Waste Land”. If you’re a fan of Symphonic Metal, you need to check this album out.